A little goes a long, long way. Less is more. Brilliance in simplicity. KISS: Keep it simple, stupid. This wine shows the truth in all these sayings. We all know that the more we try to dress something up the worse it can end up. The same can be said about winemaking. If you have great fruit then you don’t have to do much to it to make a great wine. Each time a winemaker practices a winemaking technique like oak contact or lees stirring etc it effects the natural fruit of a wine. This wine has just enough oak to give it complexity and just enough minerality to make it elegant. The key word is balance. This wine stands in the middle of the see-saw without tipping too far over into either side. Are we seeing a resurgence in popularity of Chardonnay? To an extent yes but I do not believe that Chardonnay will ever steal the top spot from varieties like Sauvignon Blanc. This is not a bad thing. You see, Chardonnay is a diverse variety and echoes climate and winemaking more so than those simple fruit-driven styles which means each Chardonnay you drink will be different. This is great for serious wine drinkers but for those drinkers who like Sauv Blanc like the fact that they can buy two different Sauv Blanc’s and they will display similar characters. What is great to know is that there are wines like this one that are priced to appeal to a wider market and show how great Chardonnay can be without costing the earth. Freshly cut grapefruit aromas mingle with subtle, toasty oak. Nice level of ripeness on the palate, peach, grapefruit and honeydew melon with a lingering saltiness. Clean and fresh. Final Say: Great value, great wine. A steal at $14, on special it gets as low as $11. Drinking a wine like this reminds us that oak is not the be all and end all. Sometimes simple, upfront fruit can be more appealing than dense oak characters. Aging in oak would tone down those pretty, perfumed, luscious characters that many of the Côte du Rhone wines display. As I have said before some varieties just need a little extra to express their potential. Grenache is quite pretty and shows delectate red fruit flavours but can be a touch light. Shiraz has pepper and dark fruits but can be overpowering. Mourvedre sits between these two but has great structure. With their powers combined they summon forth Captain Côte du Rhone or Captain GSM, the younger, Australasian cousin of Captain CDR (Côtes du Rhone). Somehow it doesn’t have the same ring to it when I sing the Captain Planet theme song. Fruit is king in this wine, it uses oak as its royal footstool. Using the barrel to stand taller but never steal the show. Just recently in Australia we have accepted that 10 years ago we were over oaking our Chardonnay and now it is considered a wine fault. This is because the fruit disappears into a mire of cedar, woodchips and pencil shavings and stops being Chardonnay. All varietal character was lost. This will never happen when drinking wines from Cote du Rhone, especially those as reasonably priced as this one. Tasting note: Musk, strawberry and white pepper rises from the glass to fill the nose. The palate is soft and elegant with red fruit characters such as strawberry and raspberry. A subtle spice and pepper rounds out this wine. Don’t bother cellaring this wine, it’s too enjoyable now. Final Say: Sing the Captain Côtes du Rhone song all the way to the bottle shop to buy this one. Enjoy with lighter red meat dishes. Sells for around $16. Welcome to part 2 of the odyssey into grape varieties starting with ‘V’. I’m sure part 1(http://spittingoptional.com/2012/07/17/martinsancho-verdejo-2010/) had your head swimming with plot twists and elaborate storytelling. There are only around 50 Australian wineries that grow and produce Vermentino making it relatively unknown in Australia. It’s an Italian variety that can sometimes be a little bland. I haven’t tried too many Australian examples of this wine (Brown Brothers, Serafino and Fox Creek to name a few) and this wine, the Yalumba ‘Y’ Series Vermentino, is probably the best example I’ve seen of Australian’s handling this grape, and guess what? It’s the cheapest as well. I was actually taken aback by how good this wine is and how little it cost. It has the elegance and varietal character of a wine three times its price. Sadly, the price point may mean that it is overlooked by many serious wine drinkers but trust me on this, flip yourself the ‘V’ tonight and give this wine ago. You won’t even notice the money is missing and there’s a fair chance you’ll buy some more. Tasting note: An herbaceous nose with hints of stone fruit. A fresh, lively palate. Rich with nuances of stone fruit, jasmine flowers and talc. It finishes with a salty, briny acid. Begs to be enjoyed with seafood. More people should drink it. So there you go. The Adelaide Hills, much like the King Valley, have long been pioneers for the Mediterranean varieties and critics have been pretty tough on them. I for one love what they are doing. Keep it up! ß A threat, not encouragement. Tasting note: Typically Tempranillo on the nose, ripe cherry, earthy and a touch of game. A rich palate, the cherry characters verge on becoming plum-like, nice spice- subtle pepper. Chewy tannins and a clean, pleasant finish. 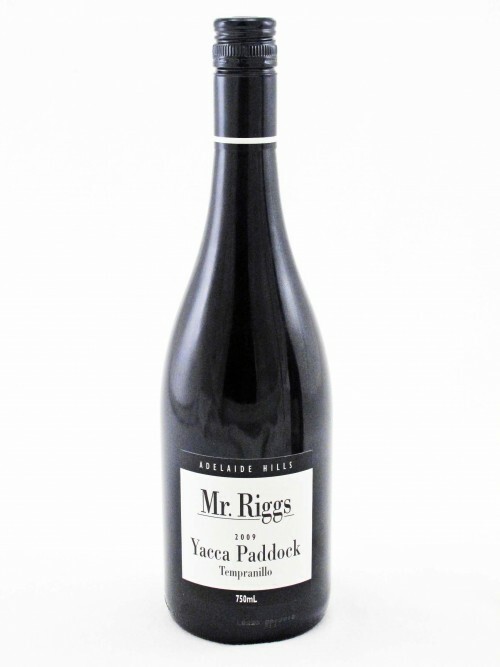 Final Say: A relatively new variety in Australia but with wines like the Mr Riggs Yacca Paddock the future is looking bright. You can pick it up for $25.